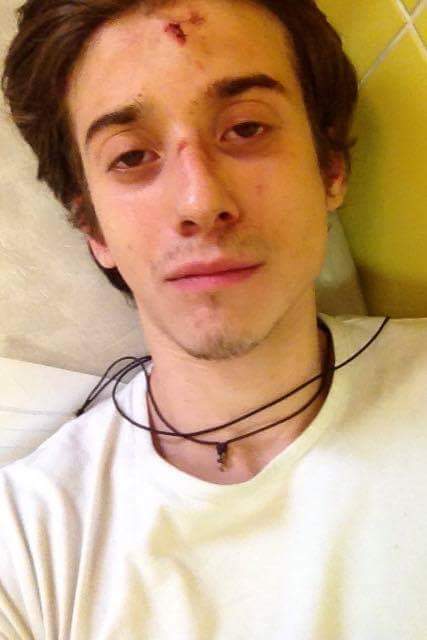 Massimiliano Romano was attacked outside a discotheque in Poznań in Poland. He was celebrating with colleagues after they’d received their first wage-packet as dancers in the corps de ballet of the Welki- Poznań Theatre. He was 18 and it was his first professional contract. Massimiliano – or Massi as he’s known to friends and family – comes from a family of dancers: Alessandra Romano, his sister, teaches folk dancing at the well-known Happy Dance school just outside Milan, and his older brother, Gianmarco, works in the ballet company of the Helsinki Opera in Finland. It was his sister who contacted me, desperate to publicise her brother’s story as the family have reached a dead-end trying to get help from the Italian authorities. On 7 October, Massi went to a disco with three colleagues from his new company: the Italian, Beatrice Rancani, Gal Trobentar from Slovenia, and Diana Cristescu from Romania. After joining the Welki-Poznań Theatre company at the beginning of September, and receiving their first monthly payment, they wanted to go out and celebrate. It was the first time that they had gone out. Massimiliano was used to be abroad having attended the Ballet Academy of the University of Music and Performing Arts in Munich for two years before graduating earlier this year. During the evening, Beatrice found that her wallet had been stolen, and the others accompanied her outside to call her father to block her credit card. Their path was blocked when they tried to return inside by two well-built poles who attacked the boys, especially the slight, 170cm Massi. They broke his jaw while throwing punches in his face and, as he fell to the ground, they kicked him repeatedly, especially around the head. The disco’s bouncers locked the doors leaving Massi and Beatrice alone outside with the two men. When finally the doors were reopened his friends brought Massi inside the club where he lost consciousness. The bouncers did nothing to help, and while others called an ambulance the two attackers returned inside the building to continue their evening. Massi regained consciousness in the emergency ward, where the treatment he was given was basic: no blanket, no ice, stiches over uncleaned skin. A day later he was transferred to another hospital, and after a two-day wait he was operated on to put a metal plate in his jaw. The Polish police are now investigating and assume that the two aggressors were the same who stole Beatrice’s wallet. The family feel helpless as brother Gianmarco’s call to the Italian Consulate on 9 October has produced no response. Massi has now returned to his flat, but can’t travel. The direction of the Welki- Poznań Theatre have been aiding him in the bureaucratic details to cover medical expenses. Hopefully articles like this one may provoke the Italian Embassy to intervene and assist this young dancer who, on his 19th birthday, last Friday, found himself in hospital having his stitches removed. UPDATE: Early this afternoon, Alessandra was contacted by an official at the Italian Embassy in Warsaw asking for information so that they can look into the case thoroughly. Apparently, the right channels hadn’t been used to contact them, and they’d picked up on the story via social media. This is sad. Please keep us informed. Is there some way to send money? I don’t think they need money, just moral support which by reading and commenting you are doing! Thank you. Very sad indeed. Sounds like the embassy had to be embarrassed into doing something. I hope we will get an update on all of the dancers. Very best wishes to Massimilano Romano for an early recovery, and to his companions. A poor show by the Polish medical system/authorities and also a poor show by the Italian consulate. I feel thoroughly incensed = we are neighbours and fellow Europeans. I am going to complain to the Polish Embassy in London; it may have no effect but I’ll do so anyway. Thanks Graham for alerting us all. Thank you for bringing this to public attention.. Please keep us informed about Romano’s progress. Horrific experience and inexcusable behavior by Polish authorities and even worse shameful lack of response by Italian consulate. You’ve done a service by posting your report.